Safety Tips for Driving Around Trucks | Phoenix Personal Injury Law Blog - Breyer Law Offices, P.C. Sharing the road with large trucks is pretty common around Phoenix, especially on the freeways and between cities like Prescott, Flagstaff, and Tucson. Driving around these big vehicles can be perfectly safe as long as you keep a few simple things in mind and make sure to always practice general safe driving procedures. You should always fasten your seat belt, obey speed limits and posted signs with traffic instructions, and never use your phone or become distracted by passengers and events outside the vehicle. One of the most important tips for driving around large trucks is to avoid the numerous and rather large blind spots that drivers of these vehicles have. Both directly behind and directly in front of the truck is a blind spot, since the large front of the cab obstructs a driver’s view and there is no rear-view mirror for the truck. On each side there is a large blind spot along the trailer of the truck. On the driver’s side, there is a one-lane blind spot from the cab to about half-way along the trailer. On the truck’s passenger side, the blind spot goes across two lanes and stretches from the front of the cab to the back of the trailer. Stay out of these areas as much as possible. When passing a big truck, you should always pass on the left side of the truck and make sure the driver sees you before you pass. 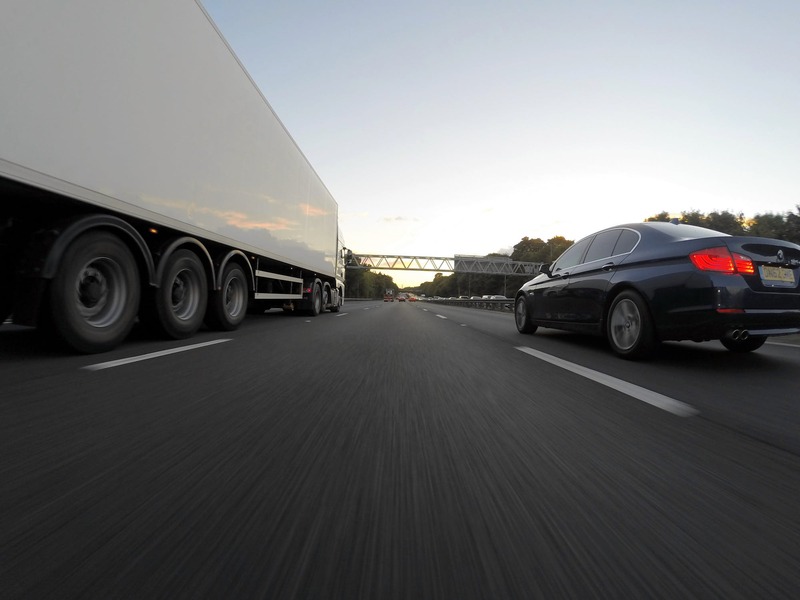 Once you begin passing, do so quickly and promptly, so long as you can do so safely, and do not linger in the blind spot along the side of the truck. Give yourself plenty of space before merging in front of the truck and signal. Never pass a large truck on a down-slope, since trucks tend to pick up additional speed when going downhill. Do not cutoff a large truck since it typically requires much more distance to slow down and stop than smaller vehicles. This is especially true on downgrades where the driver may need to use an emergency exit to make an assisted stop if the truck loses brake power. Large trucks typically make wide turns, with slightly different paths taken by the cab and trailer, so give a truck that is turning plenty of space and do not try to pass on the inside of a truck that is making a turn. Following these simple practices and controlling your vehicle safely can help you avoid collisions that are often very serious. The size and shape of large trucks often result in severe injuries or fatalities for those involved in crashes with them. If you or a loved one has been injured in an accident with a large truck, call Breyer Law Offices, P.C. today at (602) 267-1280 to discuss your case and go over your options. Do I Really Need a Lawyer After a Collision with a Large Truck?